In 2018 more and more teenagers or people up to 29 deleted their Facebook app from their devices and/ or moved to other social media platforms such as Instagram or Snapchat, studies show. This means that Facebook has to rethink their strategies in order to bring back all those people and retain the ones that still use the app. In an attempt to regain the attention of teenagers, Facebook is testing a new feature that allows users to share events to their Facebook Stories. Let’s say you are interested in attempting an event and you want your Facebook friends and followers to know about it – more than just pressing the attending button and hope that the others will notice. Even though the new feature will be available to all markets and to all users, there will be more efforts into encouraging young people to use it. You see an event you might want to join and go visit its page. There, you will see the options you have to share it with your friends, including the new one that says “Share to your story”. 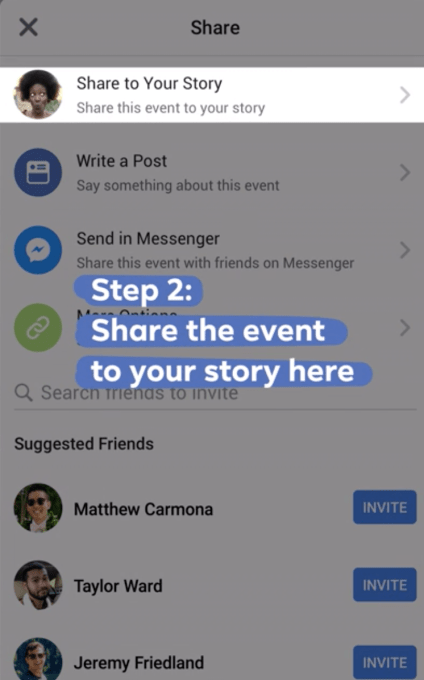 After you select this option, the event will be shared and all the people who watch your story will be able to see details about it and decide whether they want to join or not. A tappable sticker with all those details will appear within the story. If they tap it, they will be taken to the event page. When your friends press the interested button, a list will be available and you will also have the possibility of creating a group chat in order to establish details of how to meet or whatever comes to your mind. What do you think about this new feature that is still in its testing period? Do you think it will bring back youngsters to Facebook?